such sweetness runs from your hand. Have you illustrated books? I imagine a book of poetry (no matter for adults or for children), illustrated by you! :)Your style is so pure and expressive!! Rossichka: Actulally I really love to do that! Xovika: Haha, yes! They have meaning! 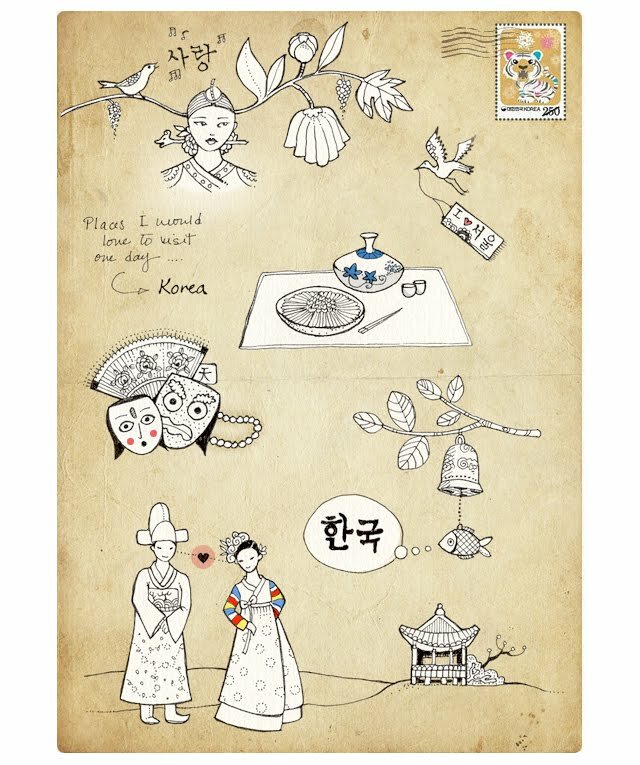 From top, the bird is singing "Love", The stork's banner says "I love Seoul" and the fish is thinking "Korea"
I find all of your drawings inspiring and soothing at the same time... better than my yoga lessons! "Ommm shanti ommm..."
Wow. The drawing is beautiful. I'm a Korean(-American) myself and I feel that your drawing captured a part of the essence of Korean culture well. You should go in the spring around March; it's a very beautiful time to go. Especially when the cherry blossoms bloom. this is absolutely beautiful, you very good korean handwriting too! that bowl up there, is it supposed to be filled with chrysanthemum tea or is it bibimbap? I found your site by way of a pin on Pinterest. I don't like Korea, because they are vindictive to Japan.